A California couple has been charged with torture after police rescued their 13 malnourished children from a home where some of them had been chained to beds, and neighbors on Monday described the family as shut-ins who shunned social contact. Police made the discovery after a 17-year-old girl escaped the house in Perris, about 70 miles (113 km) east of Los Angeles, and used a cellular phone she had found in the house to call them, the Riverside County Sheriff's Office said on Monday. The children ranged in age from 2 to 29, police said. The girl, who officers had initially thought was about 10 years old, contacted police on Sunday after escaping the one-story house. 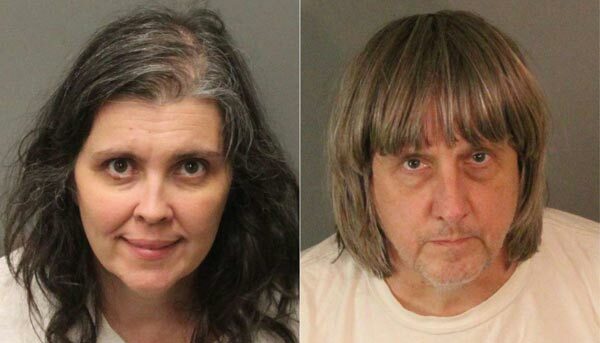 The parents, David Allen Turpin, 57, and Louise Anna Turpin, 49, were arrested and each charged with nine counts of torture and 10 counts of child endangerment. They were ordered held on $9 million bail each. Neighbors said the Turpins and their children rarely emerged from their unkempt home in the new built development of closely spaced single-family houses. Wendy Martinez, a 41-year-old housewife, said her only contact with the Turpins came as she passed the house at night in October. Four children were installing sod in the yard while the mother watched from the door, and none responded when Martinez said hello. Police said six of the couple's children were minors, while the other seven were over 18. The siblings told officers that they were starving and police did not give the parents' motive for holding the children captive. A Facebook page that appeared to have been created by the parents showed the couple dressed in wedding clothes, surrounded by 10 girls in matching purple plaid dresses and three male children in suits. California state records list David Turpin as the principal of the Sandcastle Day School, with its address at the Turpin house. Records show the Turpins filed for bankruptcy in 2011. Nancy Trahan, who works in the Temecula, California, law office that handled the bankruptcy, said the couple were friendly and spoke highly of their children. "They seemed like very nice people," she said by telephone. The Turpins are due in court on Thursday.